Adebanji Alade is the Vice President of the Royal Institute of Oil Painters and has sketched and painted for almost all his life. 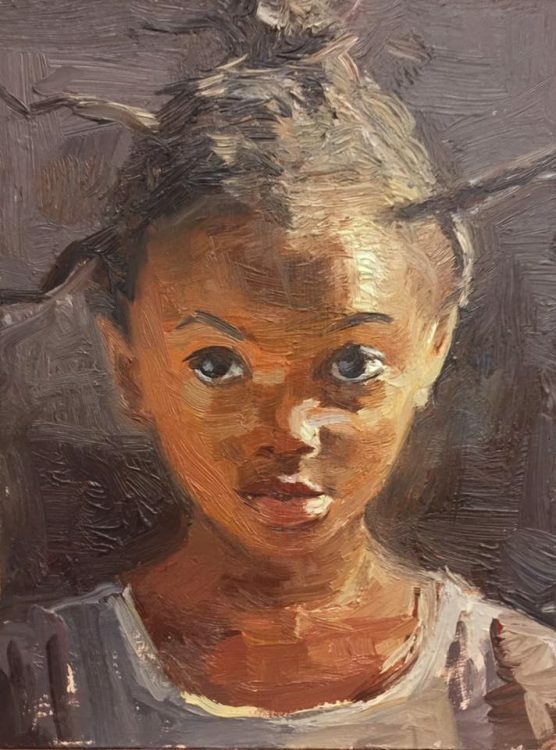 Adebanji is currently working on a project which involves painting 250 small portraits of people. They are of anyone he knows or meets, from willing volunteers and friends to celebrities and iconic people. He is self-sponsoring the project and Winsor & Newton are providing the materials. 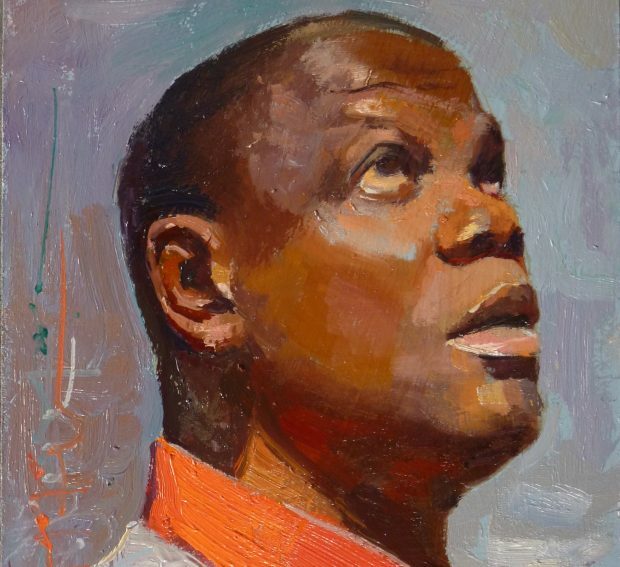 Adebanji is doing it to improve his portrait painting skills through repeated, daily practice. When the project is complete he will publish a book with all 250 portraits, discussing the processes and what he learnt along the way. I love drawing people. I sketch people on public transport almost every day – a habit I’ve developed over the past 20 years. 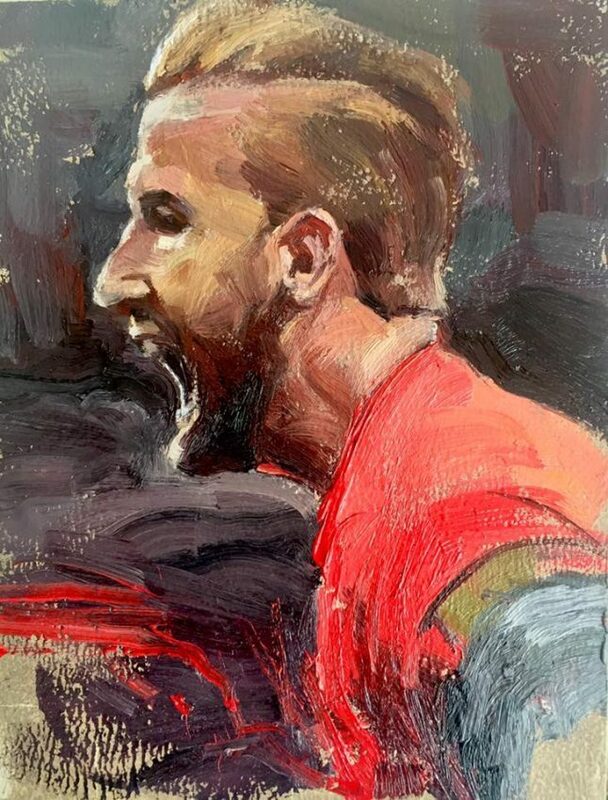 What I have noticed is that I am now able to sketch people almost effortlessly because I have done this repeatedly over a long period of time. I recently found out from an artist I admire that this is called ‘Deliberate Practice’. I decided to do a bit more research on this idea I discovered from Bryan Mark Taylor and found out that there’s a whole theory on this. I noticed that a whole piece has been written about this – it can be a bit of a long read but interesting too. It’s titled ‘The role of Deliberate Practice in the Acquisition of Expert Performance’ by K. Anders Ericsson, Ralf Th. Krampe, and Clemens Tesch-Romer. The main gist is that if you are able to have focused practice that is purposeful, regular and deliberate over a period of time, you will be able to become an expert in any area of such concentration. This whole concept really inspired me because, without knowing this theory existed, I had already seen great results in my sketches of people. I developed this over a long period by sketching on public transport every day and working en plein air, which I developed by painting 212 small paintings of the City of Bath in 4 months – I called it my Bath Marathon! Through plein air work and sketching people, I can easily say that I have become an expert in these areas with the deliberate practice concept. 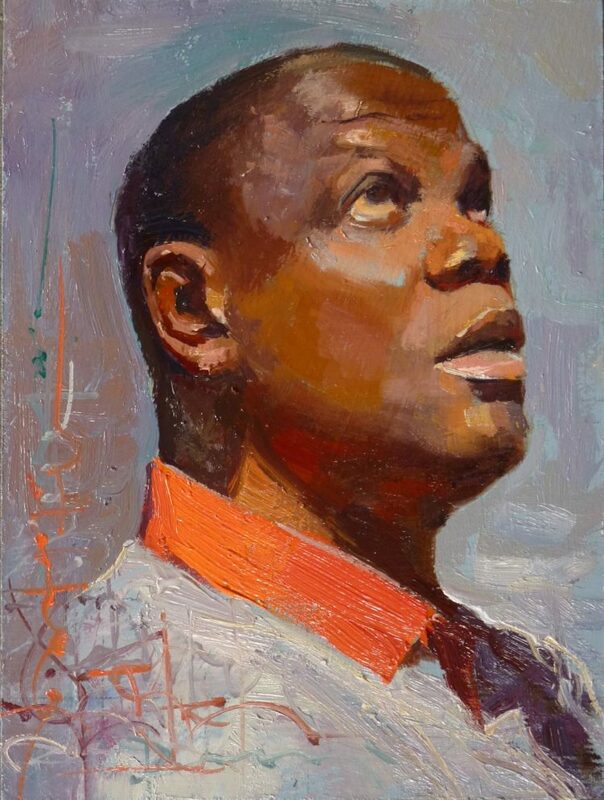 But, there is one area of my work I want to gain mastery in – painting portraits. I love painting portraits but I have never really gained the mastery of it. Sometimes it’s on and sometimes it’s off and this has really been quite embarrassing for me. So, once I heard of this theory, I decided to give myself the challenge to paint 250 portraits in 250 days. Now, that didn’t quite work out last year due to some factors but I am determined to complete them this year. I am already past number 60, so I have got roughly around 190 left! I work on 6 in x 8 in or 8 in x 10 in surfaces. If people are interested in purchasing them I let them go for £375 a piece (unframed). I work mostly in oils and I paint them on a thin gessoed MDF board. My goal is just to paint people I know, people I meet, strangers, iconic people, and friends, just anyone. 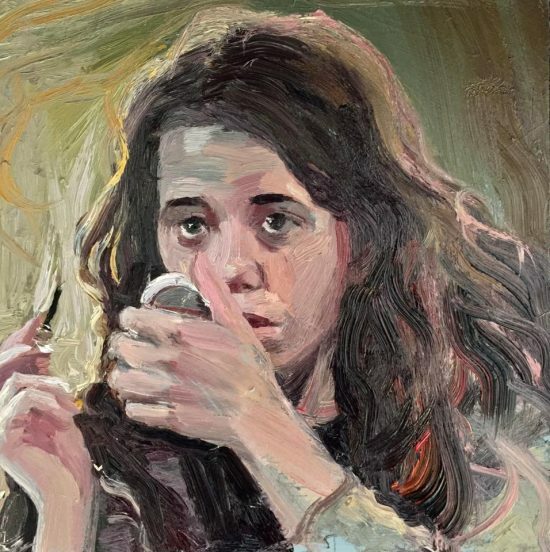 These can be from life or from photographs, it doesn’t really matter – I just want to improve my level of painting portraits to a level of mastery. I believe by constantly painting with a goal not only to get a resemblance but to fashion out a language of my own by experimenting with different techniques and procedures, I will eventually get the full hang of it. It’s not been easy. As with any other project, the beginning is always fun and explosive but there comes a time when the wear and tear sets in and the spice dies out. This has happened with this project, life has got in the way, but I have had to revive my goal and purpose again and again! I shared my idea with Winsor & Newton who produce most of the oil colours I use and they have been pleased to help with sponsoring the project with a generous supply of oil colours. 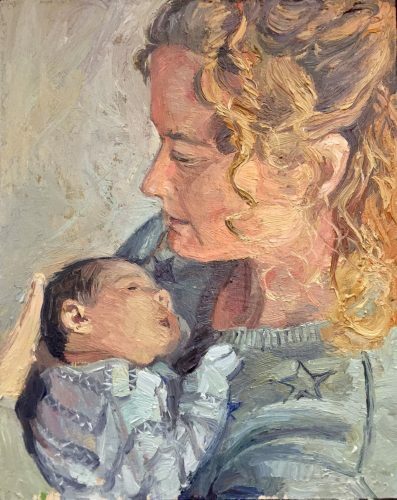 At the end of this project I plan to produce a book with all the paintings, explaining why I chose the sitters and my experience of painting them and what I have learnt. I called the whole series my Deliberate Portrait Practice. I hope I can make this happen. There is always a price for any worthy endeavour and this is my next challenge. I have always loved a challenge and this one is really daunting! 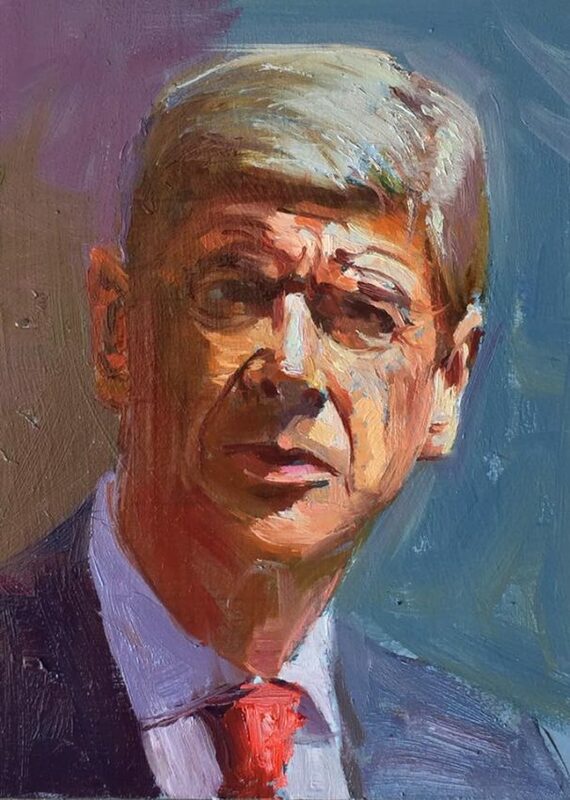 What I have learnt so far when it comes to painting portraits is that the drawing must be spot on. If the drawing is awkward, lacks a bit of accuracy, and misses a major angle or measurement; no matter the amount of fancy painting that comes on top – the portrait will never be a successful one. I have had many wipe-outs and many that have not made the cut – I am going to publish some of the failed attempts in the book too. Below are two portraits – the one that made it (right) and the one that didn’t (left). With this piece, I learnt that speed doesn’t help with portraits. 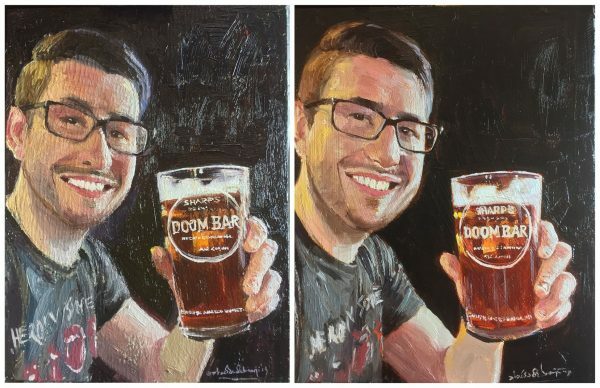 I also learnt that portraits where the person is smiling with teeth showing are better done on a bigger surface than my normal 6 in x 8 in format. I was more careful with the drawing on the second attempt and I used an 8 in x 10 in surface. If you have an idea or something you really want to gain mastery over, try this method of deliberate practice. You might need a mentor or a tutor to guide you along the way, but face your fears and go for it. It might be a long task and you might get a bit discouraged along the way but just don’t give up until you get the results you were looking for at the beginning. I have really seen a great improvement since the start. 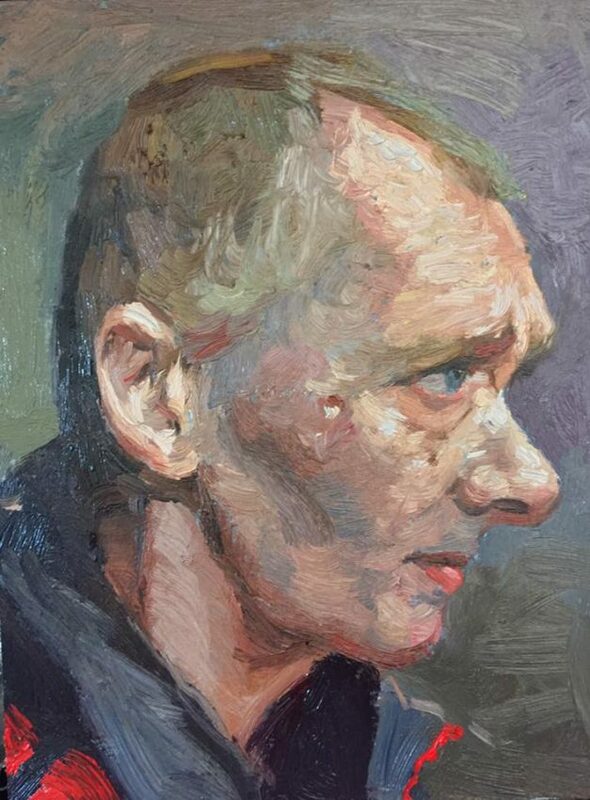 I even gained the confidence to accept a teaching job at The Art Academy, London – I took their Advanced Expressive Portrait Class for 5 weeks. The students really enjoyed my wealth of knowledge and experience. What they may not know is that it has been thanks to this project. I wonder what I’ll be able to do when I complete this project! Let’s see what the future holds. You can follow this project on my Instagram or Facebook page. Titanium White, Winsor Lemon, Winsor Yellow, Yellow Ochre Pale, Yellow Ochre, Indian Yellow, Bright Red, Alizarin Crimson, Permanent Rose, Winsor Violet Dioxazine, French Ultramarine, Cobalt Blue, Viridian Green, Raw Umber, Burnt Sienna, Burnt Umber, Ivory Black. Adebanji Alade, b.1972, is the Vice President of the Royal Institute of Oil Painters and one of the most exciting artists in Britain today. He has exhibited widely throughout the country and has won numerous awards for his dynamic, mostly urban, paintings that are full of people and life. He currently works full time as a painter from his studio on Lots Road in Chelsea, London. Whether he works indoors or outdoors, Adebanji strives to bring the life, vitality and movement of ‘the sketch’ into his paintings. He is inspired by the atmosphere, historical importance, mood, and the play of light that a particular place can offer at any point in time. Adebanji frequently presents films and interviews for BBC One’s The One Show and his sketches of commuters on the underground have also been made into the Channel 4 animated short film Two Minutes. Visit Adebanji’s website to find out more about his work. With a background in photography and painting, Daniel conducts artist interviews and writes features and exhibition articles. He enjoys gaining insight into how artists make and exhibit their work. Daniel studied at the University of London, specialising in Literature, History and Art.